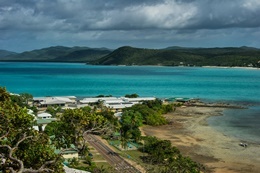 Thursday Island is the administrative and commercial centre of the Torres Strait Island region. The island has an area of about 3.5km2. At the 2016 census, Thursday Island had a population of 2900. There are 26 general/medical beds and 6 maternity beds at Thursday Island Hospital. 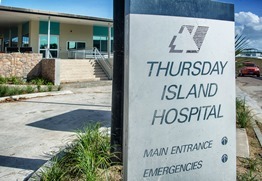 Thursday Island Hospital provides the region with healthcare services, including general medicine, maternity, paediatrics, emergency, operating suite, pharmacy, radiology, social work, speech pathology and podiatry. Financial assistance is available through the Patient Travel Subsidy Scheme to eligible patients who need to travel to other hospitals for procedures and tests not available locally. The Torres and Cape HHS worked in partnership with the Department of Housing and Public Works to construct 16 two-bedroom units and two three-bedroom houses which have all been leased for Queensland Health staff.